Dr. SAM’s Guide To Rehabilitation & Injury Prevention! Learn the Knowledge. Apply the Principles. Use the Tools. Get Results! Bottom line: Being sick and injured is not very fun! It usually leads to valuable time, money and energy being lost, which could be better invested in something else that you really enjoy doing, such as: spending time with loved ones; being out in nature; working; playing your favorite sport or game; taking a vacation; or just simply relaxing at home. We all know that health care costs are probably not going down anytime soon. Also, as you may have noticed, insurance companies seem to be paying for less and less these days! What if there was a way to help people have some kind of “health assurance” plan instead? What if there was a way to lower peoples’ anxiety and fears about recovering their health when faced with an accident or illness? What if he could share all his knowledge as a rehabilitation and wellness specialist in a way that could help thousands of people make it through some of the toughest times in their lives? The RESULT: Dr. SAM’s Guide To Rehabilitation & Injury Prevention! This innovative rehabilitation guide was designed to help people recover quickly from various health challenges (such as pain and inflammation; injuries; illnesses; diseases; and poor health conditions), as well as just simply improve their overall health and well-being– and in a way that’s safe, affordable, and easy-to-follow! The information in this manual has helped thousands of people successfully heal, prevent injuries, and stay well. Honestly, this manual could not only change your life, it may even help SAVE IT! 1. Decreased overall pain and suffering! 2. Healthy weight loss and improved body image! 3. Faster recovery from injuries and illnesses (as well as injury prevention)! 4. Healing of chronic disease and poor health conditions! 5. Improved awareness and self-confidence about healing your own body! 6. More beauty and youthful appearance! 7. More energy and improved feelings of overall well-being! 8. Injury and illness prevention! 9. Improved strength, endurance, flexibility and sports performance! 10. It’s effective and affordable– No expensive equipment to buy and healing results felt immediately! 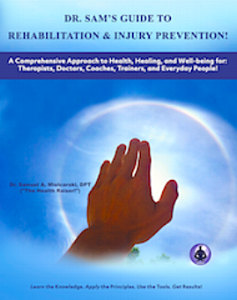 Purchase Dr. SAM’s Guide To Rehabilitation & Injury Prevention NOW! The BEST time to start a rehab program, so that you heal correctly right from the start! The 10 Key Principles of Rehabilitation that MUST be followed to get optimal healing results! The “Health Essentials”– What they are, and how to apply them correctly so that you don’t waste your precious time suffering, instead of getting well! The “Natural Laws of Healing” (including the “Golden Law of Healing”). Once you understand these healing secrets you are bound to feel better faster! The “Significant Seven” questions that should always be considered before beginning any type of rehabilitation program. Asking yourself these simple questions will help you avoid common healing pitfalls! What foods you SHOULD and SHOULDN’T eat during the healing process. This one factor can make all the difference in your results! The various health and healing factors that can motivate and inspire you. Without utilizing these things correctly, you may have a long and unpleasant journey ahead of you! Is “prevention” really a flawed concept? Learn its true meaning so that you can take full control of your health and healing! A “Question & Answer Section” with Dr. SAM that will definitely open your eyes and help transform the way you view health and healing on all levels. The significance of the ‘illusion of cure’. Understanding this one important concept will catapult your healing efforts towards success! You will meet the “Greatest Healer of All Time,” and what she has taught Dr. SAM about healing the body in an optimal manner! Practical and safe ways to manage stress, fix poor posture and alignment, and avoid pain while exercising and improving your fitness levels, so that you can live to your fullest potential! One simple strategy that can help you MELT AWAY unwanted BODY FAT and achieve healthy weight loss. You will laugh once you realize how EASY this is! The “Dome of Life”– Where to find it, and how to use it to significantly transform your health and well-being! You will find out what dirty little “four-letter word” Dr. SAM often uses to motivate his patients and clients when their health and healing results are less than optimal. This strategy works almost every time its applied. You will discover the “Top 20 Heath Excuses” people use to not change their health. More importantly, you will learn how to overcome such obstacles by answering one simple question! Q: Who is Dr. SAM? A: Dr. Samuel Arthur Mielcarski, DPT, (aka “The Health Raiser!”) is an expert in the field of wellness and rehabilitation. He has helped thousands of people transform their health and well-being. With over 21+ years of clinical experience as licensed physical therapist and wellness consultant, Dr. SAM has developed a keen seen of how to guide others toward health and healing success. Due to his ability to get outstanding results as well as his passion and quest to help others, Dr. SAM has become a highly sought after health and rehabilitation consultant. Q: What exactly is Dr. SAM’s Guide To Rehabilitation & Injury Prevention? A: It is a no-nonsense, common sense, approach to health, healing, and injury prevention. The purpose of this manual is to help people achieve the safest and most effective healing results in the shortest amount of time. Whether or not you are currently sick or injured, this manual can help provide you with knowledge and tools to empower you to live, play, and work at your fullest potential! Q: How long is the manual? A: The manual is 132 pages. How is this resource different than others? A: This manual will teach you the true secrets of what it takes to help prevent injuries, become well, and stay that way! Q: If I am not a health, fitness, or rehabilitation professional, will I still understand the information contained within the manual? A: Most likely, “Yes”. This manual was designed for both clinical professionals as well as everyday people. Although you may not understand everything that is written in this manual, you will most likely find the information you need to help transform your health; rehabilitate successfully; as well as prevent injuries safely and quickly. Q: If I have had chronic health problems for years, will this manual help me? A: This manual was written to help all those seeking better health and well-being.Your results will be based on your commitment to following the guidance outlined within the pages of this manual. Healing can only happen so fast; and you must want to get better in order for this occur. This manual isn’t meant to be a ‘quick-fix’ remedy, but it can help deliver results faster than many other methods and approaches. Q: If I read this manual, can I stop going to my doctor? A: This manual is not meant to be a substitute for proper medical care when needed. If you have medical concerns, you should work with a qualified medical professional that can help you meet your needs. However, you may find that after reading and applying the information within this manual, you do end up visiting your doctor less often. Q: What can I expect if I apply the information in this manual correctly? A: Awesome results! This could be anything from elimination of chronic health problems and injury prevention, to a whole new awareness and awakening of what it means to be human! One thing is for sure; if you apply the information in this manual correctly, you can expect good things to happen! Q: If I am not totally satisfied with the manual, can I get a refund? A: Since this manual is a digital ebook, no refunds are available. This product is a digital e-book. NO physical products will be shipped to you in the mail. Once you purchase this product, you will be redirected to a “Thank You Page” immediately where you will receive instructions on how to download the manual and your bonuses. Delivery time should be quick, but it may vary depending on the type and quality of computer equipment and internet connection you have. You will be given customer support information on the “Thank You Page” also, including a contact email in case you have any questions or difficulty receiving your product(s). This product will be in PDF format. If you don’t already have this software, a free download for this software for most operating systems (including Microsoft Windows, Mac, Unix/Linux, and Mobile Devices) can be found here (Free PDF Software).